Synthetic/Artificial Thatch is a Fantastic Roofing Alternative! Natural thatch is beautiful, affordable and authentic. However, synthetic thatch roofing is a great alternative, particularly for those who are willing to pay a slightly higher price for material that will last several years longer. Synthetic palm or reed thatch has a proven lifespan of up to 20 years, which means it lasts decades longer than natural thatch. At Tiki Shack Importer we offer artificial palm thatch and artificial reed thatch similar to bora bora thatch, Domingo palm thatch, Viro thatch panels, PVC thatching, plastic thatch, fiber thatch roofing and other faux thatch roofing/fake thatching products, with Class A fire retardant that makes these fire retardant synthetic thatch panels a safe, sound alternative to natural thatch roofing. As it can last for up to two decades! In most cases, natural thatch panels will need to be replaced at least twice during that time frame. This extended longevity makes synthetic thatch roofing a good option for commercial applications, including theme parks, restaurants and playgrounds. These properties swear by simulated thatch roofs, particularly PVC thatch materials, fiber thatch roofs and plastic thatch roofs. Then, analyze our photos of synthetic thatch roofing to determine which type of artificial thatching best matches your desired aesthetic. All of our simulated thatch roofing material is eco-friendly thatch roofing that is compatible with the green lifestyle, so you can rest assured if that is a concern. 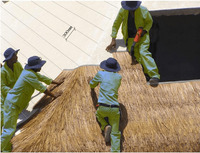 Installing artificial thatch roofing or PVC thatch roofing is simple. Install the synthetic tiki thatch panels in rows - around all edges beginning at the lower edge of the roof. Go all the way around the roof - and attach with self tapping screws, roofing stapler or nailer gun. If you need to cut thatch panels - just use a jig saw or regular saw and cut through the binding and section in, our thatch panels will not fall apart. Repeat each row overlapping 6-8 inches - till you get to the top. Minimum overlapping on each row is about 6-8”. Panels are not waterproof. • Roofing Stapler, Nailer Gun or Screw Gun. Ready to Buy Synthetic/Artificial Thatch Online? Trust the same company that supplies Tahitian thatch, African thatch and bamboo items to Disney, Sea World, Raging Waters, Universal Pictures, Senor Frogs, Hooters and so many more! Simply Place your Order Online Below! FREE SHIPPING NATIONWIDE → Below Prices Include FREE Shipping to your Door! → 80% of Orders Ship Same Business Day! Click on Pictures Below for more Information and to Enlarge Pictures. Colors may vary. ARTIFICIAL SYNTHETIC THATCH Synthetic thatch roof materials are popular thatching products for both exterior and interior designs, limited only by the imagination. It is also referred to as artificial or faux thatch and can be found in as many designs as natural thatch, simulating the same characteristics and flow. They will last for many years and are very durable and easy to handle because of their lightweight. They are weather resistant and fire retardant, lasting longer than natural thatch products making them more practical and economical over a more extended length of time. Synthetic thatch products are not susceptible to mold, rot or decay and unlike natural thatch products, birds and wildlife are not drawn to nest in it. With no maintenance required and its natural look and design, it will enhance any area chosen to display its beauty. A chemically neutral product creates no fumes that will affect the environment and is 100% recyclable. You can use the synthetic thatch in your home, in the yard, or bring it to your office to enhance any area with synthetic thatch in the same way you would use natural thatch. MAKING SYNTHETIC THATCH Synthetic palm thatch or synthetic reed thatch are two popular styles, each with a unique look and blend to add to your décor. Used primarily for roofing needs, it is also adaptable as wall coverings and thatch umbrella covers. Individual, natural looking reed or synthetic palm strips are "crimped" together to form shingles or panels that are easily installed. The high-quality synthetic compound used to make the thatch has high UV characteristics, high wind load ratings, and class A fire standards met. Each is designed to create the look of the natural reed or palm thatch with varying hues of color and leaf shapes depending on the style of the thatch that is being recreated. Synthetic thatch is made of material derived from engineered polyethylene, completely recyclable with minimal maintenance required to care for it. It has a very natural appearance, and it would be hard to tell the difference between natural thatch and artificial thatch unless you touched it or looked very carefully at it. It is fire retardant and has a longer lifespan than its natural counterpart. USING SYNTHETIC THATCH Make a difference with a tropical flare both indoors and out by finding creative designs using artificial thatch which is affordable, natural looking, eco-friendly and mold and rot resistant, adding to its longevity. Synthetic palm thatch on the backyard tiki bar roof with synthetic reed thrash accenting the walls and bar itself will create an island paradise. Adding thatch matting on the floor and, just outside the entrance, covering the patio set is the thatched umbrella, totally pulling the whole design together. A divider built to partially shield the pool area and a thatch skirt around the patio table further enhance your island theme. As we move indoors, there are ways to bring a touch of the tropics to the inside by adding some subtle touches using synthetic thatch. A wall covered with reed thatch and some palm leaves becomes an exotic focal point, enhanced by adding some reed matting strewn about the floor. Bring touches of the tropics throughout the house by adding room dividers and unique, individualized window treatment, only limited by the imagination. In addition to the natural look and charm of the faux thatch is the security of knowing the use of this product means you are installing a fire retardant, rot and mold resistant material in your home. An added plus is that tests show even termites will not infest the artificial thatch. NATURAL THATCH VERSUS SYNTHETIC THATCH As a fire hazard, synthetic thatch reduces risks significantly as they provide fire retardant options that make them much less vulnerable especially since the material itself is not as conducive to burning as natural thatch. With the natural material is an increased concern from faulty wiring and acts of nature in the form of lightning strikes as organic materials tend to be more easily flammable and the flames harder to control. Due to its organic nature, natural thatch can quickly become a place for wildlife infestation; rodents in the walls or bird nests in the roofing or stealing the thatch to build their own nest. Pests and insects invading the space are drawn to the natural habitat and make it their home. A synthetic thatch roof, while just as aesthetically pleasing, is not as likely to be subjected to infestation as it does not appear as a natural habitat. Natural thatch is subject to high winds dislodging the fronds during a storm, and since the vegetation picked to make the thatch is now dead, it has lost its capacity to shed water and be considered waterproof. Its resistance to rain is dependent on the knowledge of the builder to slope the roof to the correct angle for proper watershed. It is also subject to decay and mildew as the elements continually assault it. Synthetic thatch is usually certified to be wind resistant to as much as 140-180 mph gales and is UV resistant to protect from fading over time. Synthetic thatch is an industrial strength product that is 100% waterproof. While natural thatch is a natural material and is eco-friendly, the high maintenance and frequency of replacement is a short-term option. If opting for synthetic thatch, it is produced to be just as sustainable and eco-friendly, likely to last over 20 years, but is 100% recyclable. When it comes to maintenance, natural thatch is subject to wind, rain, and other degradable circumstances, exposing it to mildew, mold and fungal attacks. It needs systematic inspections to correct damages and leaks. Synthetic thatch, designed to be storm and wind resistant, requiring almost no maintenance or constant upkeep to maintain its original beauty, will thereby save a small fortune in upkeep fees. Low maintenance and durability make for a product that lasts decades longer than natural thatch making it easily affordable if you pay a little higher price for material that will last several years longer.